Our parents told us to eat more greens. Our teachers told us, too. Nutritionists have been saying it for years. Heck, even Popeye got in on the act. And the message is finally sinking in: eat more vegetables, eat them often, eat them enthusiastically. 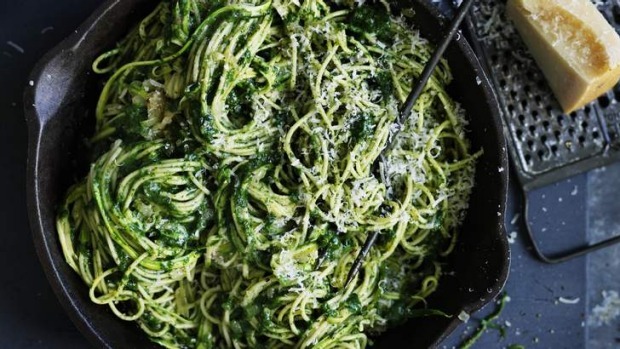 The buttery spinach puree gives this pasta dish a delicious richness as well as its vibrant colour. Keep this entrée-sized as the perfect start to your green meal. 1. Heat two-thirds of the butter in a small pan over low heat and sauté the spinach for about a minute, until just wilted. Transfer the spinach and butter into the bowl of a small food processor or blender and process to a smooth purée. 2. Cook the pasta in plenty of boiling salted water according to the packet directions. In a large frying pan, heat the remaining butter over medium heat and fry the anchovies (if using), garlic and onion until fragrant. 3. Add the zucchini and salt and toss for about 3 minutes until softened. 4. When the pasta is cooked to your liking, transfer it into the zucchini and toss to combine. Remove from the heat and stir through the spinach puree. 5. Serve topped with a little parmesan cheese.